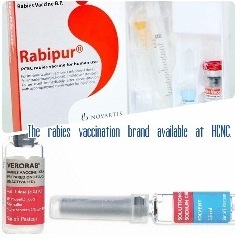 • Pre-exposure vaccination: protect those who are at risk of exposure to rabies. • Post Exposure vaccination: to prevent the development of clinical rabies after exposure has occurred, usually following the bite of an animal suspected of having rabies. The vaccines used for pre-exposure and post-exposure vaccination are the same, but the immunization schedule differs. Rabies immunoglobulin is used only for post-exposure prophylaxis. • People at high risk of exposure to rabies, such as laboratory staff working with rabies virus, veterinarians, animal handlers, wildlife officers, and other individuals living in or travelling to countries or areas at risk. • Travelers with extensive outdoor exposure in rural areas. • Children living in or visiting countries or areas at risk, where they provide an easy target for rabid animals. • Individuals travelling to isolated areas or to areas where immediate access to appropriate medical care is limited or to countries where modern rabies vaccines are in short supply and locally available rabies vaccines might be unsafe and/or ineffective. Pre-exposure rabies vaccination consists of three full intramuscular (i.m.) doses of cell-culture- or embryonated-egg-based vaccine given on days 0, 7 and 21 or 28. For adults, the vaccine should always be administered in the deltoid area of the arm. For young children (<1 year of age), the anterolateral area of the thigh is recommended. Rabies vaccine should never be administered in the gluteal area: administration in this manner will result in lower neutralizing antibody titers. Periodic booster injections are not recommended for general travelers. However, in the event of exposure through the bite or scratch of an animal known or suspected to be rabid, individuals who have previously received a complete series of pre- or post-exposure rabies vaccine should receive two booster doses of vaccine on Day 0 and Day 3 combined with thorough wound treatment. Rabies immunoglobulin is not required for patients who have previously received a complete vaccination series. Modern rabies vaccines are well tolerated. The frequency of minor adverse reactions (local pain, erythema, swelling and pruritus) varies widely from one report to another. Occasional systemic reactions (malaise, generalized aches and headaches) have been noted after intramuscular or intradermal injections.